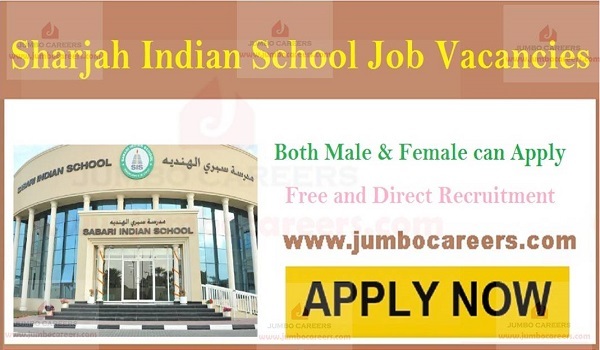 Leading Indian Community school in UAE: Sharjah Indian School (SIS) Sharjah hiring teaching and non teaching staff. For latest Sharjah Indian School Free Recruitment January 2019- Sharjah Indian School is conducting walk in interview for hiring teaching and non teaching staff for 2019. Its free and direct recruitment by the school. Salary range for Sharjah Indian School SIS Sharjah jobs varies between AED 3000- 12000 per month. * Kindergarten Teacher preferably with bachelor’s degree along with 3 years of regular course in Arts or science. Additionally, at least 1 year regular course in Montessori. * Social Studies Teacher must have experience and graduated in B.Ed along with 3 years of regular course and master’s degree with 2 years of regular course in any of the following subjects either history or geography or social studies. * Mathematics Teacher must have experienced and graduate qualified in B.Ed along with 3 years of regular course and master’s degree with 2 years of regular course in Mathematics. * English Teacher are required to have a bachelor’s degree in B.Ed along with 3 years of regular course and master’s degree with 2 years of regular course in English literature. Must be qualified and experienced as well. * Hindi Teacher preferably with bachelor’s degree in B.Ed along with 3 years of regular course and master’s degree with 2 years of regular course in Hindi. An experience will be considered as well. * Art & Craft Female Teacher with having a bachelor’s degree along with 3 years of regular course in fine arts and teaching experience in English Medium School. * Physical Education Teacher required with a bachelor’s degree with 3 years of regular course in Physical Education. (Female Only). * Rest of Jobs would be fulfilled with relevant education and experience. All interested candidates are requested to DOWNLOAD links given below fill all the marked fields thoroughly. Once you have done everything accurately, carry all the documents given below in a separate folder during an interview. It will be checked an verified by the panel members. * Attested certificates of degree, PG and B.Ed. Location : Sharjah Indian School, Al Wahda Street, Qasimiya Street, Al Ghubaiba, Near New Gold Souk, Sharjah.